JustJulie was one year old on the 30th December and I promised you a giveaway didn't I? 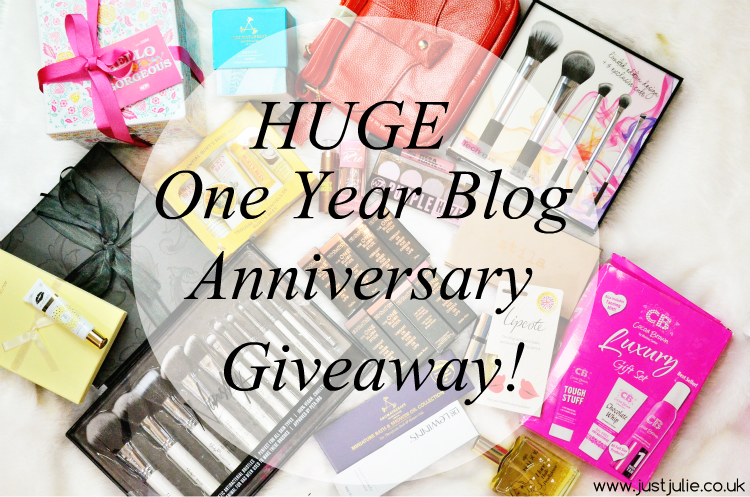 Well today is my 200th post and I couldn't think of anything better to post than the one year blog anniversary giveaway that I promised you. I've been planning this giveaway for sometime now. I wanted to do something big, a way of a thank you for everyone who has been reading my beauty ramblings for the past year. Originally this was planned for the 1st January but with the Christmas and New Year post being a bit slow it has had to be delayed, but it's here finally and I'm so excited about it! Also due the fact I have a lot of readers who live in different countries this giveaway will be international, I mean I just couldn't exclude you guys! What can you win I hear you say?! 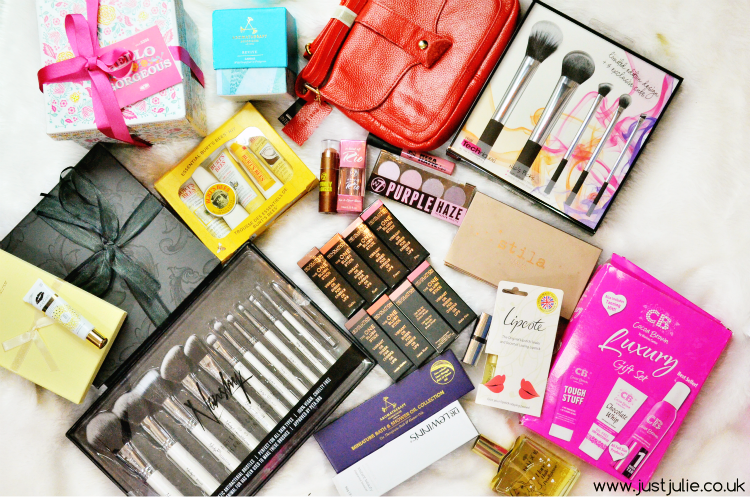 Well you have the chance to win over £400 worth of beauty products!!! Yes I said it was going to be big, and when I totalled everything up I didn't realise how much everything came to! Want to see what's included?! Obviously there are some there are terms and conditions to this giveaway, I've learnt with my past two giveaways that some people tend to not read the rules and end up having their entries voided, so please read them. I check every single entry to ensure the giveaways are fair, and of course legal! 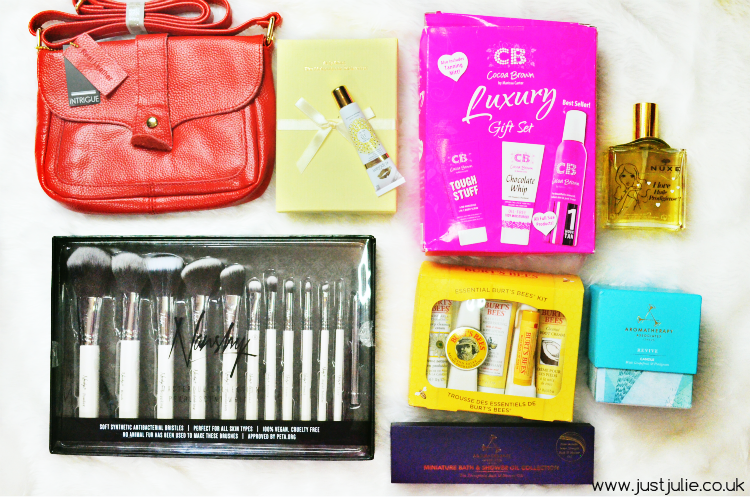 You are entering for the chance to Win over £400 worth of beauty products. There are TWO MANDATORY options for you to enter, which are to follow me on Bloglovin and on Twitter. Both options are MANDATORY which will give you a total of 10 entries for the chance to win. Additional to the two mandatory options you also have 18 other options to enter, which are all optional, but by entering all of the options you will gain an additional 41 entries, totalling 51 entries with the two that are mandatory. By not completing both mandatory options you hereby void all other entries. You can only retweet the giveaway as part of entering ONCE every 24 hours. Any Retweets in less than 24 hours will be voided. If you are under 18 please obtain your parents or guardians permission. The winner will be chosen by random via the Rafflecopter within 72 hours of the giveaway ending. The winner will then be notified via DM on twitter within 72 hours of being chosen, and then announced on twitter at the same time. At this point please send me your email address. The winner will have 28 days to respond to my DM. If after 28 days I have had no reply another winner will be picked, again by random via the Rafflecopter. Prizes will be sent by myself via the cheapest method of postage courier with a tracking code included. Thank you to everyone who has supported me. Here's to another year of blogging!